Some of the greatest challenges of stemming the rise of hate speech and violent extremism played out on Capitol Hill in real time Tuesday, as lawmakers aired fundamental differences about what poses the biggest threat, who is to blame — and what to do about it. 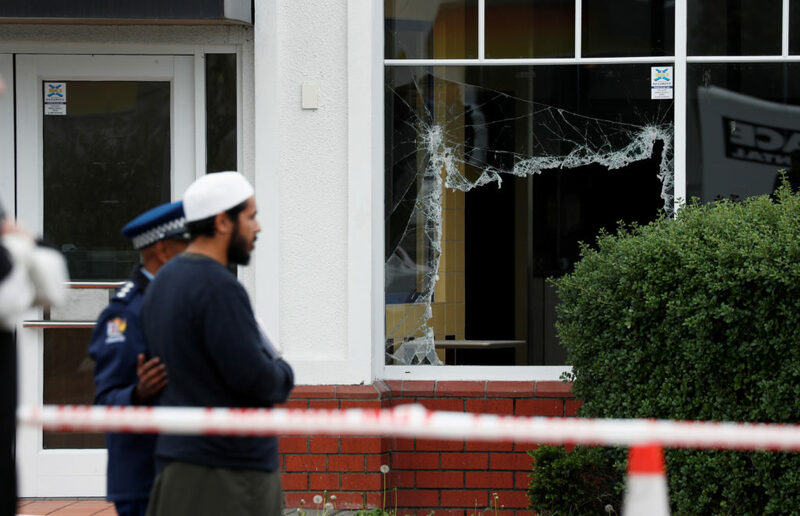 Democratic lawmakers had called for Tuesday’s House Judiciary Committee hearing after a gunman attacked two mosques last month in Christchurch, New Zealand. The suspect’s social media accounts indicated he was inspired by white supremacist ideologies. The differences between how Democrats and Republicans approach hate crimes was starkly evident not only in their lines of questioning but also in the people they invited to testify. Civil rights groups sat on the panel at the invitation of Democrats; Republicans invited a black conservative commentator who accused Democrats of being more interested in fear-mongering than in racism. At the hearing, representatives from Google and Facebook also faced extensive questioning on how they handle hate speech by their users. But as the tech giants defended their attempts to combat the problem, white nationalist groups were using a Google-owned platform — YouTube — to raise money via a livestream video of the hearing. The Anti-Defamation League testified Tuesday that 78 percent of extremist murders in the U.S. last year were by perpetrated by white supremacists. An analysis by The New York Times also found a third of “white extremists” who carried out killings since 2011 were inspired by other killers with similar motives. “We as a society, our laws, and our elected leaders have not focused sufficiently on the rising threat of white supremacy,” Anti-Defamation League Senior Vice President for Policy Eileen Hershenov said. 78 percent of extremist murders in the U.S. last year were by perpetrated by white supremacists. Hate crime incidents reported in 2017 rose 17 percent from the year before, according to the most recent data from the FBI. The Anti-Defamation League has said reports of hate crimes in recent years have risen against people based on religion, ethnicity and immigration status. The number of hate groups also rose to a record high last year, according to the Southern Poverty Law Center. But Wray and others have cautioned the increase could be driven in part by FBI and nonprofit organizations’ efforts to encourage more people to report hate crimes. Democrats invited representatives from the Anti-Defamation League, the Equal Justice Society and the Lawyers’ Committee for Civil Rights Under Law. Republicans invited Candace Owens, a black conservative activist, and Zionist Organization of America President Mort Klein, a pro-Israel activist. Owens, who said she has been the target of repeated racist incidents perpetrated by left-wing activists who disagree with her conservative views, accused Democrats of using the hearing as a political tool. “White supremacy, racism, white nationalism — words that once held real meaning — have now become nothing more than election strategies,” she said. Klein invoked data from the Anti-Defamation League that shows nearly half of Muslims around the world harbor anti-Semitic views. “This has to be explored, but people are afraid to because then they are called an Islamophobe,” Klein said. Hershenov, with the Anti-Defamation League, said there is no evidence that crimes against Jews are disproportionately perpetrated by Muslims or vice versa. “In a democratic pluralist society like the U.S. should be, is meant to be, if we don’t join in coalition and have each other’s backs, no minority is safe,” Hershenov said. Democrats and other witnesses blamed President Donald Trump’s rhetoric and immigration policies for the rise in white nationalism. “Unfortunately, at a time when decisive leadership is needed, the president’s rhetoric fans the flames with language that, whether intentional or not, may motive and embolden white supremacist movements,” Rep. Jerry Nadler, D-N.Y., said in his opening remarks. The gunman accused of killing 50 people at two mosques in New Zealand referenced the American president in an online manifesto, calling Trump “a symbol of renewed white identity.” After the shooting, the Council on American-Islamic Relations, the largest Muslim advocacy organization in the U.S., called on Trump to condemn the attack. “Mr. Trump, your words matter. Your policies matter. They impact the lives of innocent people at home and globally,” CAIR National Executive Director Nihad Awad said at a news conference. But when asked if white nationalism posed a rising global threat, Trump said he didn’t see it that way. Meanwhile, Klein, Owens and Republican lawmakers on the committee placed blame on the controversial left-wing group Antifa, short for anti-fascist, and also criticized what they described as an attempt by U.S. universities to crack down on right-wing speech on campus. Trump signed an executive order last month to require higher education institutions to protect free speech or risk losing federal funding. The suspect in the Christchurch attack leveraged social media to spread his white nationalist message. He livestreamed the shooting on Facebook. Even after Twitter, YouTube and Facebook took steps to remove it from their platforms, the video was re-uploaded multiple times to YouTube and continued to spread on WhatsApp, a messaging platform owned by Facebook. After receiving criticism that its most recent hate speech policies did not go far enough, Facebook announced Monday it was banning a number of additional white nationalist hate groups from the platform. The Facebook and Google employees who testified at the hearing said their companies use a combination of artificial intelligence and human reviewers to flag and remove problematic content. “It’s a fully holistic approach,” Facebook Public Policy Director Neil Potts told lawmakers. “We try to leverage our technology in that space and we are hoping to get faster. Google Public Policy and Government Relations Counsel Alexandria Walden said YouTube similarly works to demonetize and cut off comments from white supremacist groups. But even as she was speaking, Red Ice TV, an organization run by white nationalists, was livestreaming the congressional hearing on YouTube and bringing in donations from its viewers. YouTube later cut off the comments and donations, but Red Ice still promoted donations via another website in its YouTube video description. Hershenov warned that even as mainstream websites work to remove hate speech, this can also unintentionally push extremists into “underground” forums where they are more difficult to track. A report the Anti-Defamation League released Tuesday shows a rise in racist slurs on less mainstream platforms, including 4chan and Gab, in recent years. Some witnesses said the U.S. government has not focused heavily enough on moderating right-wing extremists. 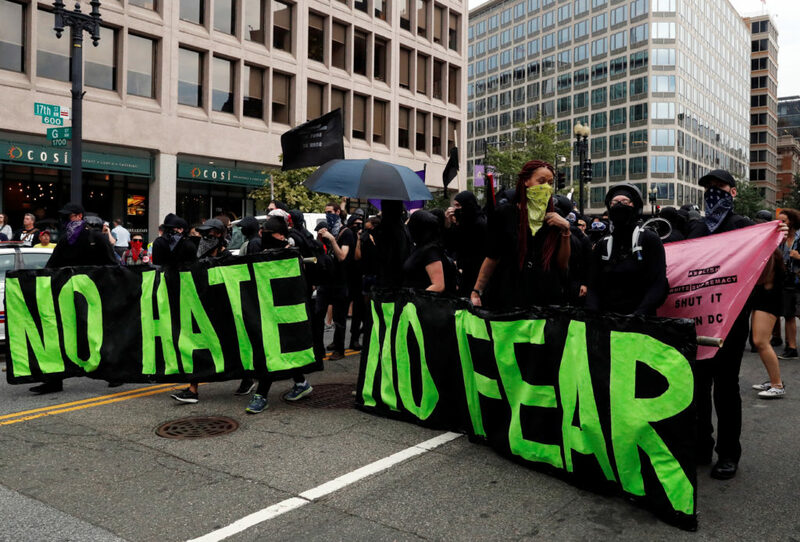 The Daily Beast reported last week that the Department of Homeland Security quietly dismantled a group of analysts who focused on domestic terrorism. Homeland Security said it was only a restructuring and that analysts were still focusing on the issue of domestic terrorism. But anti-hate group activists at Tuesday’s hearing criticized the news, saying it was a move in the wrong direction. Kristen Clarke, president and executive director or the Lawyers’ Committee for Civil Rights Under Law, said the government has been focusing on false threats. In 2017, the FBI issued a report on “black identity extremists” who were perceived to spur an increase in violence against police officers. At the time, the American Civil Liberties Union said the report was “flawed” because it based its conclusions on false assumptions about six violent incidents and ignored data showing attacks against police officers are rare. “It is not a real threat,” Clarke said, arguing it was a backlash against the Black Lives Matter movement. “It harkens back to the dark days of our federal government using its power to go after civil rights activists,” she said. Clarke called on the FBI to do more to encourage local law enforcement to report hate crimes and on the Justice Department to use its “bully pulpit” to condemn hate. In another hearing on the Hill, U.S. Attorney General William Barr said the Justice Department needed a better handle on how big of a problem hate crime is. Part of that, he said, is rooted in local reporting, adding that the department is working on a new reporting system that would create better and more specific fields for hate crime data. Meanwhile, Republicans and their witnesses called on the government to investigate more incidents perpetrated by left-wing groups, particularly on college campuses. Republicans and their witnesses called on the government to investigate more incidents perpetrated by left-wing groups, particularly on college campuses. 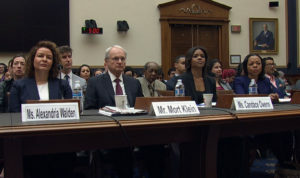 At Barr’s hearing, Rep. Brenda Lawrence, D-Mich., asked him why the Justice Department has prosecuted fewer civil rights cases — including those that address hate crimes, police bias, and disability rights — than the Obama and Bush administrations. But Barr agreed with Lawrence that the number of hate crimes is increasing. “I am very concerned about hate crimes,” he said, adding that data he’s seen have shown an increase since 2013. But Barr said he hasn’t seen any data that show it’s different under the Trump administration. House lawmakers did not indicate how they planned to proceed after the hearing ended. Senators introduced a bill last month that would require additional study of the role the internet plays in fostering hate speech, but it is unclear whether that bill will receive enough support to will move forward. During the House hearing, Mohammad Abu-Salha, whose daughters and son-in-law were killed in what he said was a hate crime, called for lawmakers to set aside their differences and unite to address the problem. “I truly plead to you not to let another American family go through this because our government would not act to protect all Americans,” Abu-Salha said.